Quicker copies with Robocopy . . So I was messing about with Robocopy over the weekend and I decided to re-run an old copy job, using a new Desktop. To query and list the sessions on the remote session, you could use QUser.exe or QWinsta, or Powershell. Powershell is my usual weapon of choice . .
PSTerminalServices is a PowerShell module that helps you manage Terminal Services (including Remote Desktop connections) sessions and processes. The module is based on an open source project named Cassia (version 2.0.0.60), a .NET library for accessing the native Windows Terminal Services API. Enumerating terminal sessions and reporting session information including connection state, user name, client name, client display details, client-reported IP address, and client build number. Displaying a message box in a session. Enumerating all processes or processes for a specified session. Cassia has been tested on Windows Server 2008 R2 beta (RTM? ), Windows Server 2008, Windows Server 2003, Windows XP, and Windows Server 2000. It should work on Windows Vista as well. The following functions are added to the current session when you import the module: Disconnect-TSSession – Disconnects any attached user from the session. Get-TSCurrentSession – Provides information about the session in which the current process is running. Get-TSServers – Enumerates all terminal servers in a given domain. Get-TSProcess – Gets a list of processes running in a specific session or in all sessions. Get-TSSession – Lists the sessions on a given terminal server. Send-TSMessage – Displays a message box in the specified session ID. Stop-TSProcess – Terminates the process running in a specific session or in all sessions. Stop-TSSession – Logs the session off, disconnecting any user that might be connected. For more code examples use Get-Help <cmdletName> –Examples. # Logs off all the active sessions from remote computer 'Labserv07', no confirmations. # Gets all Active sessions from remote computer 'Labserv07', made from IP addresses that starts with '10'. # Displays a message box inside all active sessions of computer name 'Labserv07'. PS>$Message = "Important`n, the server is going down for maintenance in 10 minutes. Please save your work and logoff." #Gets all processes connected to session ID 0 from remote computer 'Labserv07'. NOTE: if you are using Windows XP, you need to add this location into your System path: C:\Windows\System32\DLLCache. To do this, in command prompt, type the following. Remember – killing an active session will log off the user – so play nice! # Today’s quick and easy function is a simple one that I regularly use to query a SQL database. ## with the result returned as as a PowerShell object. ## QuickQuery-SQL "server" "database" "t-sql query"
## $output = QuickQuery-SQL "MySqlServername" "MyDatabase" "SELECT * FROM MyTable WHERE name = 'MySearchValue'"
$connString = "Server=$server;Integrated Security=SSPI;Database=$database;Application Name=$connectionName"
Ever had 2 PCs with 2 Screens . . but did not fancy messing around with 2 keyboards and 2 mice? Sourceforge have written a cracking (and free) tool that will allow you to share one keyboard and mouse between multiple different computers. what I particularly liked was the fact that I could copy and paste (both text and images) between desktops . . even when they are running different Operating systems. how many times have you had to move a VM from a Datastore on one ESX host to that on another. and/or c) are licensed to the correct level. 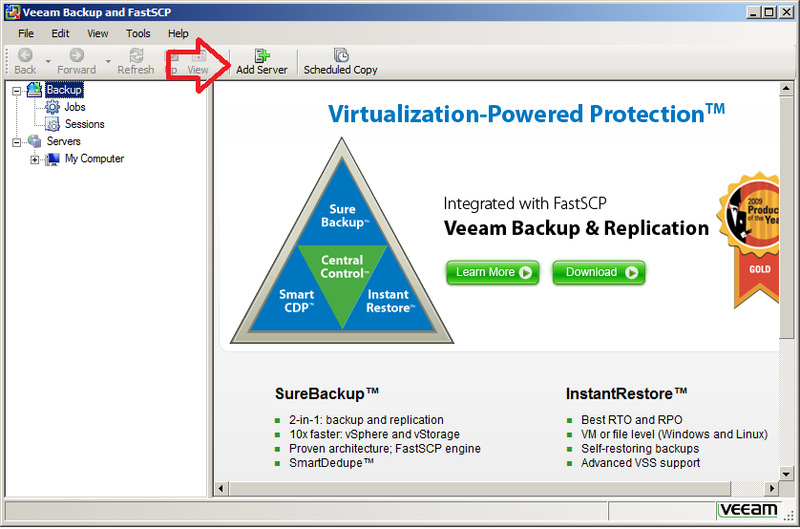 the solution . . Veeam’s FastSCP. you can add the ESX hosts, or your VC . . or even multiple VC is you have them (I use this to move vmdks between the lab and production . .
Once you’ve added your Virtual Centre(s) – you can simply browse the datastores and copy files as if you were using Windows explorer.